Asiana Airlines is Korea’s second largest carrier after Korea Air. Asiana Club, the airline’s loyalty program, offers members exceptional deals on certain routes, including flights between the U.S. and Korea, Europe, and parts of South America. The program also has some unique perks, like its generous family mile sharing and pooling program and the ability to pay for excess baggage with miles. Asiana’s program isn’t the most flexible, though. It doesn’t offer miles plus cash awards or free stopovers. You can book complex itineraries, but you have to call and you’ll probably have to pay extra. Fuel surcharges, however reasonable, are also levied on all Asiana flights and most partner airlines. To earn Asiana Club miles, you can fly on Asiana or one of its partners, transfer points from Starwood’s Preferred Guest, or earn miles using the Asiana Visa Signature Credit Card. The Asiana card has a generous earning scheme, offering three miles on tickets and two for groceries and gas. 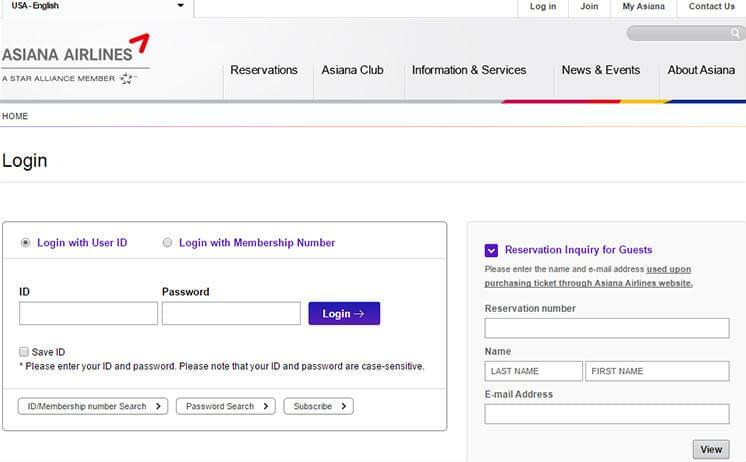 When Should You Use Asiana Club Awards? Asiana Club was a distance-based program, but it recently changed to a region-based scheme. 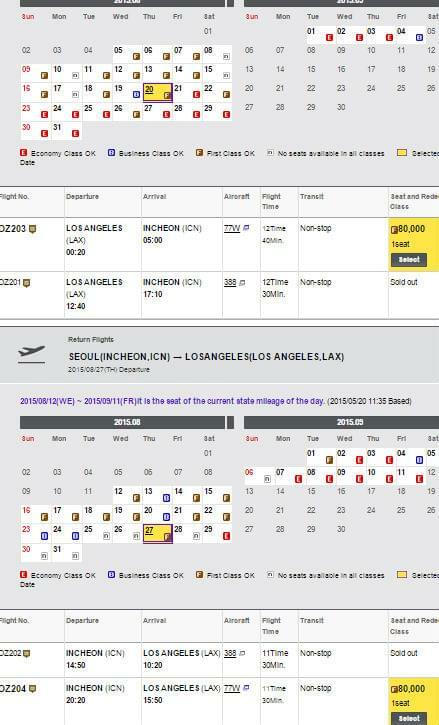 Under the new program, the best values are on specific routes, but since there are two different award charts, they differ depending on whether you’re flying on Asiana or a partner airline. For award flights to and within Korea, flying on Asiana Airlines offers the best value. 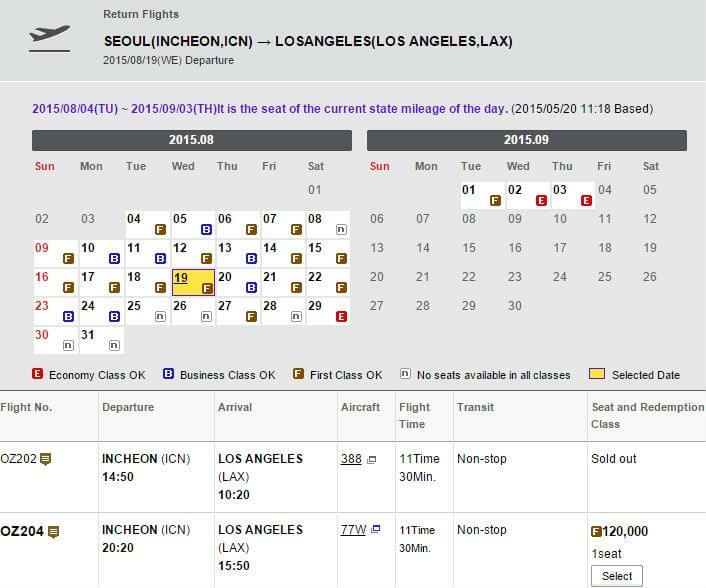 For round-trip flights between the U.S. and Korea, business class can be booked for as little as 105,000 miles, and first for as little as 140,000 miles. Asiana’s luxurious First Suites only coast 160,000 miles. 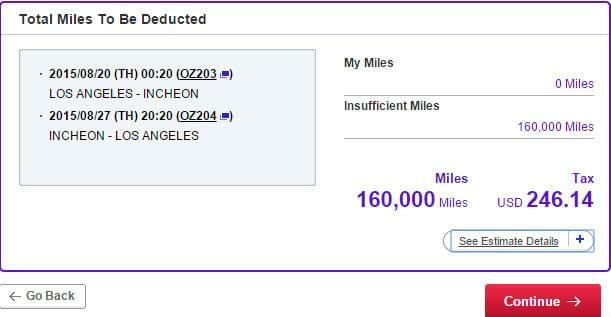 Round-trip tickets within Korea are only 10,000 miles. Asiana Club miles offer some of the best value among Star Alliance carriers on flights to Europe, particularly if you avoid fuel surcharges by flying on United or Air Canada. Round-trip tickets can be as low as 50,000 miles in economy, 80,000 in business, and 100,000 in first. Flying on Star Alliance partners to southern South America also offers excellent savings, plus there are no fuel surcharges. Economy costs 50,000 miles, business class is 70,000, and first runs 90,000. It’s typically best to keep your itineraries simple. Although Asiana says it allows seven stopovers on partner flights, they aren’t free. You can book segments separately and add them together, but that costs more miles. The airline does allow open jaws. 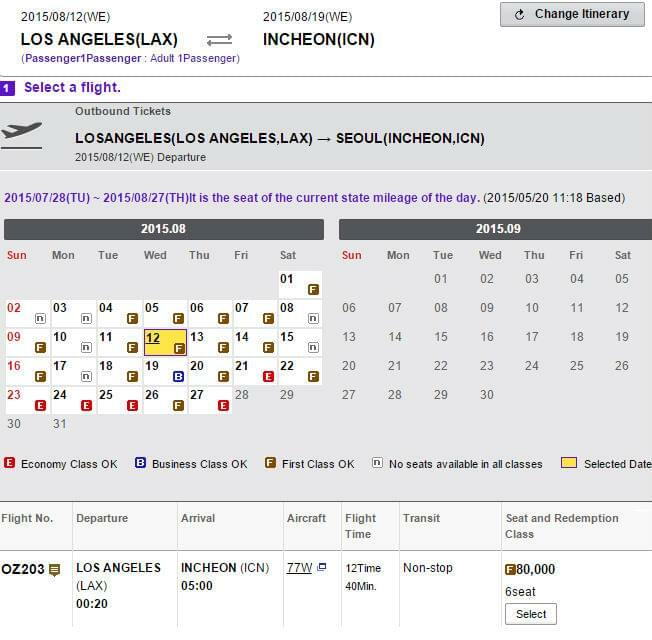 Finding your way around the Asiana website can be a bit confusing, at least for U.S. customers. 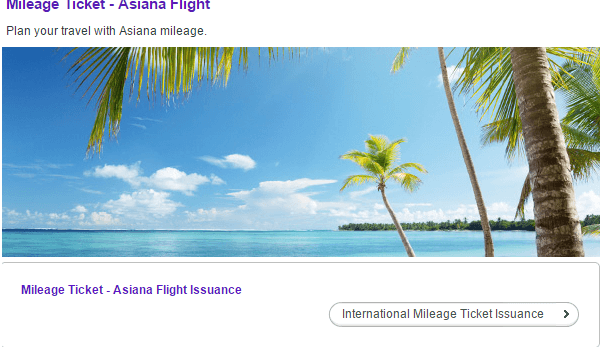 On the next page, click “international mileage ticket issuance” to book an international flight. Next you’ll be able to see the award ticket availability for two weeks before and after your preferred dates. The calendar shows the cheapest available class. F refers to first class, B to business and E for economy. The dates in our example only have first class availability. If you want to fly business or economy, you have to remember the dates these classes are available on, then click “go back” and change the search dates. Flights departing from the U.S. and from outside the U.S. have different off-peak dates, which apply even if the flights are on same itinerary. That’s why the inbound flight costs 50 percent more. If you’re flexible, you can sometimes avoid paying more by changing dates. If the travel dates are moved up one day, making the return date August 27, then both flights will cost 80,000 miles. 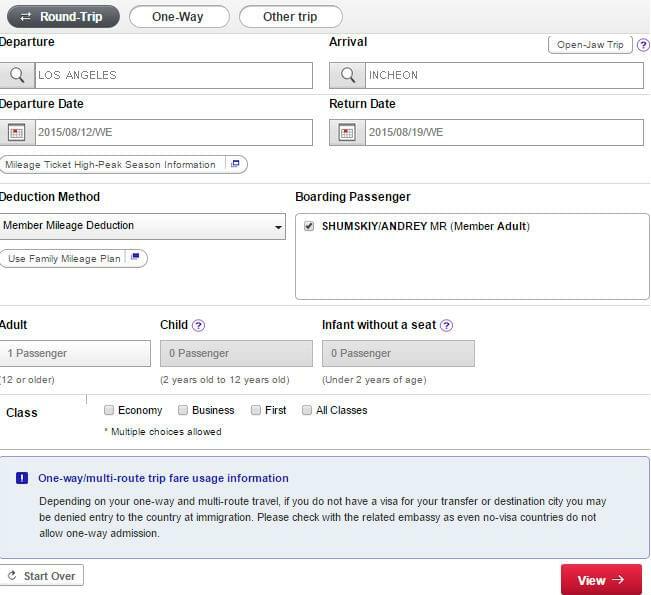 Hit “select” to add the flights to your itinerary. After selecting your flight, you’ll see a summary showing the cost in miles, in addition to the taxes, fees and fuel surcharges. In this example, the flights cost 160,000 miles and $246.14. Fuel surcharges account for $161.80 of that amount, which is relatively low compared to many airlines. Hit continue and enter your billing information to complete the booking. Asiana’s U.S. call center is located in California and is open Monday through Friday between 8:30 and 5:30 PST. Try to avoid lunch hours when waits can be long. You have to call to book flights on partner airlines and to create complex itineraries. Thankfully, there’s no fee for booking by phone. Asiana agents are usually well-trained and very courteous. However, it’s always a good idea to research your itinerary online beforehand. If you are booking a Star Alliance flight, the United Airlines website is easy to use and includes most partners.